I was forced to sit through the State of the Union Address by my husband although I figured I would need to be pretty toasted to get through it without stroking out. So instead I groomed my angoras and plucked more of their molting wool which was enough of a distraction that I felt no need to comment other than sporadically (not only was I forced to watch, I was forbidden to comment until afterward). If only he were sincere. If only he, and Congress had followed through with their promises when they all started this journey together. A tale not told by an idiot, to be sure; but full of sound and fury, definitely signifying nothing. Health Care Reform??? More like Health Insurance Reform! And actually not even that; it’s just mandating health insurance. So…let me get this straight…according to this bill I now HAVE to buy health insurance, whether I want to or not (and I do, I’m too old to think I’ll live forever)…and there are no limits on what insurance companies can charge for that mandated health insurance…and I will now be TAXED on the portion of my health insurance that my company purchases for me as INCOME…and the ban on denying pre-existing conditions is apparently being quietly changed to only apply to people UNDER 19 YEARS OLD…and I can be fined or go to jail if I don’t comply. How is that anything but a handout to insurance companies??? 1. Set limits on what health insurance companies can charge. Period. If they’re non profit companies, then they shouldn’t be making a profit at all. Therefore, no bonuses for executives; no marketing to drum up new clients, and no ridiculous salaries. That should save LOTS of money for insurance bills. 2. Require health insurance companies to cover anyone who applies, without filling out a questionnaire, and without charging more for those who do have any type of pre-existing condition. The whole idea for health insurance to begin with, as with all insurance, was to create a wider and deeper pool thereby people would share risk. If this cuts into profits, so be it. One should not be making a PROFIT on pain, illness, and suffering anyway. I thought that was the purpose of non profits — to provide the best coverage possible for the least price, because there IS no profit motive! 3. Require a flat tax based on income that goes SPECIFICALLY AND ONLY toward a public option. Or allow all citizens to opt into Medicare. Either one. I don’t really care which. I personally would opt into either if I had the opportunity; it bugs me to no end that I get grief up the wazoo for my pre-existing conditions from my insurance company while people on Medicaid/state insurance for the poor get everything covered without question. It makes me think being poor and out of work is maybe a better option than being gainfully employed if I want insurance that will actually cover my illnesses. Am I being pollyanna-ish? Naturally; politicians being beholden to corporations rather than to the people who elected them, they will of course do what is best for the corporations. Which being people in the eyes of the law have lots more money, time, resources, etc than I will ever have no matter how many of my fellow constituents I band together with to change things. I simply will never be able to buy John McCain a $20,000 dinner like Blue Cross Blue Shield of Arizona can and probably does. Multiply that by how many hundreds of elected officials at the state level, and how many thousands of elected officials at the national level, and who can compete? Why do they need voters at all? Iran seems to do quite well without bothering to count their votes. I wonder how it will go if/when people simply refuse to pay? I’ll think seriously about jail time versus being forced to pay for something I am then taxed on. Maybe THAT’S what all these FEMA camps I keep hearing about are for; to hold all of us dissidents…? This is the article that talks about getting rid of the universal ban on denial of pre-existing conditions. You have to read it carefully; the article says it will ban denials for children under 19…which means the rest of us are screwed. Thanks to all of you up there in Congressland. So glad you have better insurance than I’ll ever dream of, courtesy of ME, the TAXPAYER. I’ve had a lot of those moments lately. The new gardening year has officially started for us at the Tin Foil Hat homestead. We planted our seeds for the garden in the little starter boxes. Tomatoes — 50 plants — because I’m ever the optimist, and because I don’t expect all of them to live. 20 pomodoro plants, 10 of a different variety of pomodoro, Ida Gold orange tomatoes, Black Krims, a bunch of heirloom cherry tomatoes called Sugar Lump. For some reason, the cherry tomatoes make the most delicious salsa! I’m not sure, but I think it’s the combination of the chiles’ smoky hot with the tomato sweet that really makes it. And I want to try my hand at making my own tomato paste this year too. Anaheim chiles because however many we plant, we always run out of chiles before the next crop comes in! 20 of those. 10 Marconi sweet red peppers, 10 hybrid green peppers; we chop them and freeze them, and use them all winter long. More chard, spinach, turnip greens, bush beans, sugar pod peas, fava beans. I haven’t ever had luck with favas but I think it’s because I always wait until too late in the year to plant them. This year they’re already direct seeded in the front planter boxes (OK, they’re rubbermaid tubs but they work!) and I’m hoping they’ll do better. 10 long italian purple eggplants. I would like to also plant some of the little white ones as well, but I have to order seed. There are few things better than munching on home made nan with baba ganoush made from home grown and roasted eggplant. 15 sweet potatoes in water, with the hope of slips to plant. We’re going to be trying a few squash varieties that supposedly squash bugs aren’t interested in, that taste pretty similar to zucchini, this year. And I would still love to grow loofa! I need to order rhubarb starts; mine died in the heat of the summer mostly, I think, because it didn’t get a good start before the heat set in. I’m going to keep it in a planter for this year and bring it indoors if it gets too wilted looking. I wanted a greenhouse, but they’re not cheap; my little hoop houses made from plastic and PVC didn’t hold up at all to our winds so that idea was a bust. So this seems to be working so far — the window gets sun for most of the day. The next project on the list is to add some beds to the side yards, and install drip irrigation on at least some of the beds; watering is getting to be a very time consuming project and while I do believe the best fertilizer is the gardener’s shadow, I also believe I’d like to spend more time weeding and mulching vs. feeling stressed about the time spent watering instead of doing those tasks. Preserve something: nope, not this week although I did dry some green onions a few weeks ago. 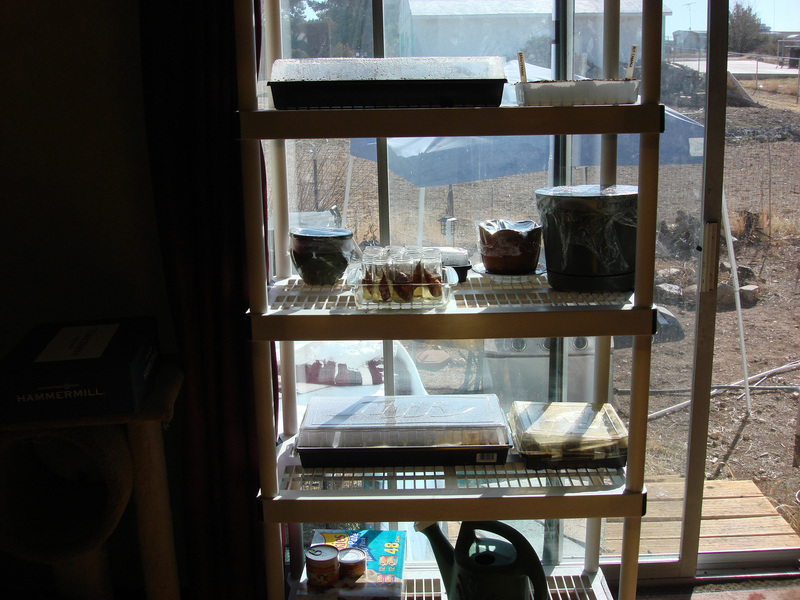 Waste not: still using most of the same starting trays I purchased several years ago. I had to buy a few new ones since the old ones cracked and sprung leaks. Best of all, who knew that a disposable suture tray is the perfect size for keeping two flats of peat starter cups? I brought one home from work several months ago after I disinfected it with the idea of using it for plant starts and it’s perfect! Eat something: yep. Tomato sauce, salsa, bread from home stored bulk wheat, eggs, chard, rice from stores, frozen veggies of all sorts, frozen cherries, jams, peaches, leftovers. Build community systems: unfortunately no. I have to get over my aversion to leaving the house on my days off (I’m gone for 15 -16 hours a day on the days I work so I literally come home in time to go to bed) and get over to the high school and offer my assistance with their FHA program. They want to start a massive compost heap, use the heat from the compost to keep tilapia, use the waste on the greenhouse plants, and sell the fish and the produce. Which is a fantastic idea and totally doable!!! I think January is the best month of all for a gardener. The possibilities are endless and the fantasies are as yet unpunctured. I need a pellet gun. This is one of about 20 dove that come to fight with the chickens for scratch every morning. I want a pellet gun. 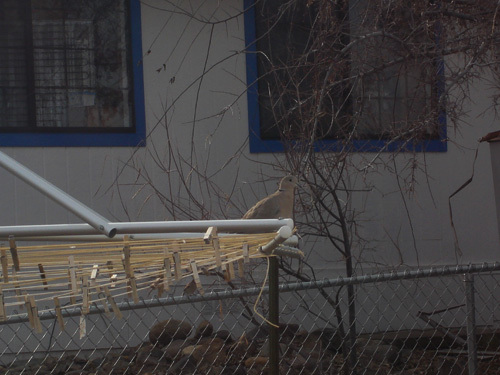 That’s two things sitting there on my clothesline: 1. varmint killing and 2. dinner. Since starting back to school, I have been on an accelerated schedule. Each class lasts just five weeks but crams 16 weeks worth of information into each one. This has meant that I’m spending a lot of time doing school work as I have two discussion questions and a paper due each week. Doing this post keeps me in the same spot, but is different than doing school work. Thankfully. My brain hurts. I worked on the ambulance recently and was dispatched to an area ED to take a patient to an in patient psych facility for suicidal ideation. Fine, no problem, we do this all the time. When I got there, I received the history from the nurse caring for the patient. It seems she had remarked to the doctor that she just wanted to put a gun to her head and end it all, that she screwed up everything she tried, and that everyone would be better off without her. She had access to a gun at home, so this was not just idle conversation. Well, OK. That will definitely buy you some time to cool off in a controlled environment. What happened next is that the nurse also proceeded to inform me that she had two small children at home, under the age of two. I remarked that well, yes, and killing her self would be SOOO much better for her children than having their mother (however much of a screwup she might think she is) around, that knowing their mother killed herself would be great for them. The nurse gave me a rather surprising response: “WE don’t make judgments!” Well, yes in fact we do…or we would not have made the judgment that she was in danger of hurting herself, of putting her children in danger, and therefore went through the effort of placing her somewhere that she could hopefully get help. This was not a chronic ‘abuser’ of the system, this was a young mother in a situation where she felt overwhelmed and without resources. You may think my response was inappropriate, but it wasn’t without compassion for either her or her children. I guess I just don’t understand the reasoning that leaving one’s children motherless is better than having a flawed, caring mother. This idea of being non judgmental I have come to believe is killing our society. Of course we judge! And we should! Else how will people with a temporary down in their lives be helped back up? Of course we judge! Otherwise people who steal wouldn’t go to jail. Of course we judge! What has happened is that the concept of judgment has been rolled in (at least in mental health and health care circles) with the idea of condemnation. And this has led to the idea, perfectly framed by the above nurse, that we don’t judge. Utter nonsense. We don’t condemn. This idea seems to have spilled over into society generally. Both in the job that I do, and by virtue of being a clergy person in a minority religion, I have seen more than my fair share of people who really have no social or interpersonal skills, who are downright self destructive in their determination to be nonconformist, who use that word ‘judge’ as a bat to beat anyone who points that out to them. Now of course, if one is pointing it out when the comment is not solicited, and the person is not in a position to require said pointing out, it is naturally inappropriate and unwanted. However, when said person is in the ED due to self destructive behaviors, or asking for counseling type help due to the same self destructive behaviors, then it is both solicited and appropriate. Judgment entails an idea of the ethical and moral basis for living in society. For instance, I personally happen to believe that, if you are strong enough, mature enough, and well adjusted enough, then a group marriage is possible. I personally am not enough of any of those things, and neither is my husband, and therefore since we know we are not, we choose not to have a marriage that encompasses more than the two of us. However, neither of us condemns anyone who realistically and honestly evaluates themselves and their situation and seeks out that sort of marriage. We know of couples that made it work for more than twenty years. We also, however, know a couple that we married in the service of our clergy duties, who successfully managed to destroy a marriage of nearly a decade in less than a year because they didn’t do that evaluation of themselves before they opened up their home and marriage. They not only destroyed their marriage, they lost their home, their business, and forced their child into the loss of both his parents in the home together. Am I making a judgment? You bet. Just because you like the idea of something doesn’t mean it’s practical or a good idea. We judge, perhaps unfairly, the pot smokers. Well, it is (presently) illegal, but is it immoral? Is it unethical? Does the doing of it hurt themselves or their families? Naturally, if they get caught and go to jail it does, but I’m speaking of purely the actual use of the drug. I’m not going to pass a negative judgment on it, nor will I condemn it. I really can’t see a problem in a personal choice. A nurse condemned me not too long ago in the comments section of another blog for *gasp* passing judgment on some people on welfare and food stamps, saying I was a discredit to my profession by making judgments because we as nurses do not pass judgment. Ah, sorry, as the condemnation shows, we both can and do, quite often against members of our own profession, whom we hold to much higher standards than the people we care for (showing perhaps just how little some of us really do value our clients…?). Well, sorry, but if you can afford acrylic nails, you can afford food. If you have a nicer phone than me, you can afford food. If your diamond is bigger than mine (which doesn’t take much but I got exactly what I wanted) you can afford food. Now, you may not be able to afford takeout, you may not be able to afford premade frozen food, but frankly your priorities are messed up if your phone and nails and jewelry mean more to you than feeding your family. We have a whole legion of people in society who want neither to be productive nor self supporting. And yet they also do not want to be judged. Sorry, can’t have it both ways. Judged, yes. Not perhaps condemned though. Judgment offers a way to point out problems, and a way to offer solutions. Condemnation may point out problems but it certainly does nothing to offer solutions. Do I prefer judgment? Naturally. I decided to go back to school for my bachelor’s. Today in fact was my first day of class. I don’t care so much about having it, but it means a little more money. Most importantly, it opens many doors for future advancement. Whether or not the world comes to an end financially this year, I plan to continue on this journey as long as I am able. I am really starting to realize that my special interest lies more in preventative health care. Especially since nearly everything I see in the ED is due to preventable illness or lack of forethought. I like my job but I leave my job many more days than I would like with a little sadness that so many things are so messed up for so many people. I made nearly all of our holiday gifts we gave this year, with a few exceptions; some things I just can’t knit, spin, sew, or cook! We also made nearly all the food for the holidays from stores, and from scratch, other than the free range turkey for the big family get together. We had a wonderful Solstice get together with friends, and even though we had to leave early so I could get to bed and go to work the next day it was worth being kind of tired. Lots of stuff has happened at work recently that has been fodder for blogging but I have to sit down long enough to sort it out first. I believe the first signs of the collapse are visible. I couldn’t get mantles for my Aladdin lamp because there was a problem with the manufacturer…in China I assume as most things are made there now a days. My thyroid medication is back ordered due to supply issues with the manufacturer and I have found a compounding pharmacy that makes a bio-identical product but at a much higher price. Which I’ll happily pay versus not having. Much fewer cars on the freeway on most days that I go to work than there were even last year. Many more people in the ER who don’t have insurance of any kind. Organic chicken feed being chronically out of stock at my local feed store. The local Home Depot being so empty that I can get not one, but three employees to help when I go. We got a used cage to rehome the bunnies in, and are in the process of getting it habitable for them. As is typical for me, it has turned into a much more complicated project than I first envisioned — I’m not sure if I just overly simplify everything, think I’m a lot faster at stuff than I am, or if I just attract Murphy and his law since it was my birth name.